AWKWASANE, NY – After temperatures soared into the high 90s last week The Mohawk International Raceway saw much cooler temperatures outside this week but the racing was still intense. 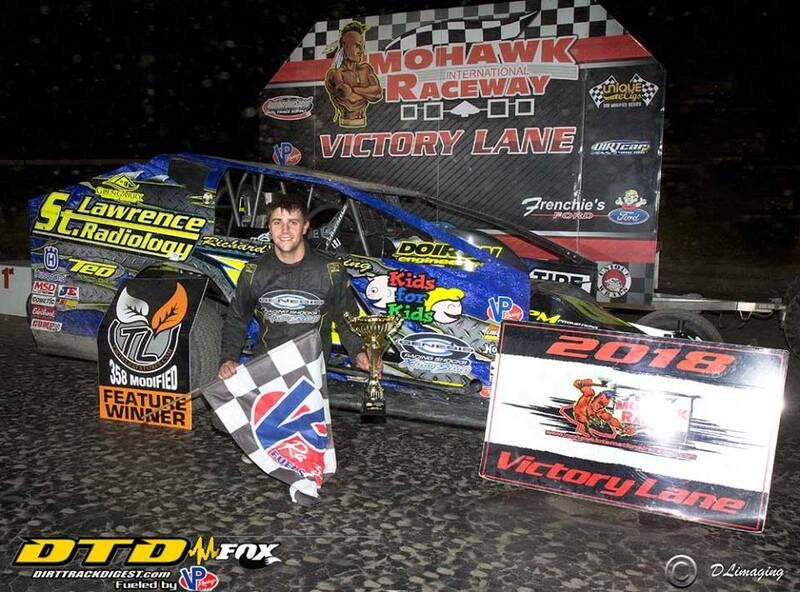 Race number 2 of the MIR 358 Modified Series highlighted the evening and night sponsor St. Lawrence Radiology along with the great fans, were treated to a fantastic night of racing. Jordan McCreadie took command early on at the start of the 50 lap Twin Leaf Convenience 358 Modified contest over Tom Conklin, Billy Dunn, Lee Ladouceur and Louie Jackson Jr. The field started to get spaced out early on as McCreadie had a fast race car and opened up a sizeable advantage on the field in the opening laps. By lap 10 McCreadie had caught lapped traffic which brought Dunn back into the picture and the top 2 began to put on a show John Mulder brought out the first yellow of the night as he slowed to a stop in turn 4 but was able to continue on. When the green flew McCreadie continued to lead the way but Billy Dunn challenged his fellow Watertown native many times but McCreadie held the top spot with no problem while behind them Chris Raabe had started to charge forward from his 8th starting spot to 3rd with Conklin and Ladouceur completing the top 5. The leaders once again began to enter into traffic Just before halfway but the caution would fly yet again as Keith Weston spun his machine in turn 4 but was able to continue on. When the green flew McCreadie Dunn and Raabe started to run away from the field while Lee Ladouceur was having his own struggles trying to keep 11th place starter Tim Fuller behind him. Fuller would get by on lap 33 and was on the move towards the top 3. The leaders began to work in heavy traffic which is where Raabe took ful advantage taking 2nd from Dunn and then went to work on McCreadie. On lap 48 Raabe had finally caught the leader and made a great move off turn 2 on the bottom to take over the top spot. On lap 49 the yellow flew setting up a green white checkered finish. When the green flew for the final time Raabe got a great start and was able to put enough distance between himself and Jordan McCreadie to march on to his 2nd straight MIR 358 Modified Series and 4th win of the year. McCreadie would take 2nd while Tim Fuller was able to get by Billy Dunn for 4th while Lance Willix made the charge from 17th on the grid to finish 5th. The Crossroads Tobacco Sportsman took to the speedway and veteran Billy Cook took control of the race in the early going over Andy Howard, Johnathon Ferguson, Gregg Snyder and Thomas Cook. On lap 4 Howard had enough of running 2nd as he took the top spot away but Billy Cook was not about to back down as he battle the Hammond New York native for the next several laps. With Howard and Cook putting on a fantastic show for the lead defending track champion Johnathon Ferguson was closing in quickly and after a couple of tough weeks, was looking to get some momentum going with a good run. As the race neared the halfway point Billy Cook started to turn it up as he closed in using the bottom lane while Andy Howard stayed committed to the top side. On lap 14 Cook was able to get the advantage as he took over the lead once again and was looking to charge on to a popular win but lapped cars were starting to become a factor which played right into the hand of Johnathon Ferguson Gregg Snyder and Thomas Cook as they all began to close in. On lap 18 the caution flew as 2 time Bandit champion Richard Thornton clipped an infield tire on the front stretch ending his night with a broken left front. On the restart Andy Howard made a move as he took the lead away from Billy Cook and began using the extreme outside lane which proved effective. Johnathon Ferguson saw how good it was and did the same thing as he took 2nd from Cook and began to close in on the leader. After having not won since June 3rd of 2016 Andy Howard finally put it all together as he scored his first win of the season over a fast closing Johnathon Ferguson, Billy Cook held on for a solid 3rd place finish after battling for the lead while Cedric Gauvreau and Gregg Snyder completed the top 5. The Green’s Performance Mod Lite division had seen a repeat winner all season and defending track champion Nick Mallette was looking to change that as he took over the lead at the drop of the green flag over Matt Fregoe, Allyson Prince, Dan Reif and Brad Reif. With a fast race car and clear race track Mallette was able to put nearly a straightaway over himself and the rest of the field. By the halfway point Mallette continued to lead but Dan Reif, Styles Arquiett and Harley Brown were on the charge as they started to reel in the race leader. On lap 11 Scott Sharpe spun his car in turn bringing out the yellow which would help the cause of Dan Reif. On the restart Mallette did not get off the turn like he wanted allowing Dan Reif to sneak by on the bottom to take the lead. With that stumble by Nick Mallette Harley Brown would make his way to 2nd with 2 to go and charged after the race leader. With 1 to go Harley Brown made a solid effort in turn 4 but it would not be enough as Den Reif became the first 2 time winner in the Green’s Performance Mod Lite division. Harley Brown would finish 2nd for the 2nd week in a row over Mallette, Styles Arquiett and Matt Fregoe turn in his best ever run with a 5th place finish. Novice Sportsman saw Gavin Riddell make his way to the front at the drop of the green flag and would make a statement that he would be the car to beat as he drove away from a stellar top 5 as Xavier Perrin, Joshua Pete, Kurt Russell and Eugene Tarbell completed the top 5. Riddell who has 2 Rookie Sportsman wins at Brockville in 2018 was on cruise control and had a straightaway lead by lap 5. On lap 6 Jason Rose spun his car in turn 2 but would be able to rejoin and make some noise before the finish. When the green flew it was no contest as Riddell marched into the race lead over Perrin, Dale Gonyo, Kurt Russell and Brian McGinnley. As the laps wound down Riddell was clearly the dominant force but behind them Dale Gonyo would make a charge to 2nd and Jason Rose was making a big move through the field coming from last and taking the 3rd spot from Xavier Perrin but had a lot of work to do to catch the top 2. In the end it was all Gavin Riddell as he notched his first Novice Sportsman win at Mohawk in 2018. Dale Gonyo scored his best finish of 2nd over Jason Rose who came on strong for 3rd over Brian McGinnley and Kurt Russell. The Bandit division finally had its first 2 time winner of the season last week with Gary Sharlow scoring the the win and Sharlow would pick up where he left off as he took the lead early over Jeff Trapp, Nick Perham, RJ Tressider and Ian Bressett. Sharlow again had a quick race car and was looking to run away and hide. On lap 5 Michael White spun in turn 4 bringing out the only caution of the race. When the green flew Sharlow picked up the lead over Trapp and Perham and began to open up another big lead. On the final lap thigs got exciting as coming off turn 2 Sharlow got pinned behind a lapped carp allowing both Jeff Trapp and Nick Perham to close in. But off turn 4 Gary Sharlow had just enough to hang on and score his 2nd in a row and 3rd of the season over Trapp and Nick Perham. Next week a full card of racing will go green with SUNY Canton on hand as the night’s sponsor. A special Enduro qualifier will take place at the end of the night with the winner getting a guaranteed spot into the annual Ironman Slick Track Enduro in September. Racing begins at 7:30pm. 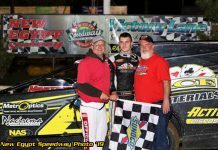 For more information and updated results, points and anything happening at the speedway, check out our website at mohawkintlraceway.com or follow us on Facebook and Twitter.